17 Nisan 2019 Çarşamba 20:00 - 1 reads. Peru's former President García is dead. The 69-Year-old was shot in the Morning in his house just before a planned arrest in the head. He is said to have been involved in a corruption case. 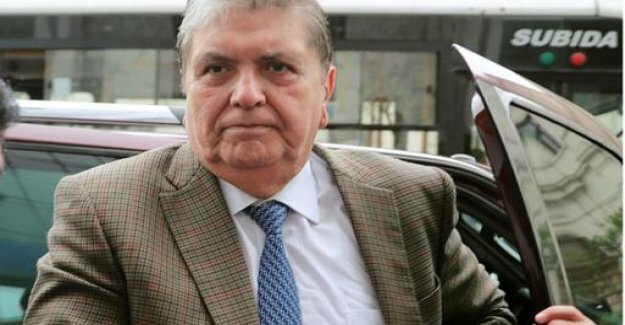 The former Peruvian head of state Alan Garcia is dead. He died, reportedly of a gunshot wound to the head, which he had added shortly before a planned arrest. According to the Minister of the interior Carlos Morán García said the security forces came to arrest him, he wanted to call his lawyer. Then he had locked himself in a room in his apartment and shot himself. He was then in a hospital. Despite emergency surgery, not the Doctors, to save his life. "We are dismayed over the death of former President Alan García," wrote the acting President Martín Vizcarra on Twitter. Against García was determined on suspicion of accepting bribes. The justice had arranged a ten-day remand against the former President. He is from the Brazilian construction company, more than 100,000 U.S. Odebrecht- $ (90,000 euros), disguised as a fee for an appearance at a conference in Brazil. In return, he should have the award of state construction contracts to Odebrecht easier. García denied, Odebrecht to have the money accepted. "You can not arrest people on the basis of speculation, that would be a great injustice," he said on Tuesday evening in a conversation with the broadcaster RPP. Peru had imposed, because of the corruption investigations, a travel ban against the social Democrats, the state from 1985 to 1990 and from 2006 to 2011, the state top. García fled then in November in the Ambassador's residence in Uruguay in Lima, which he left in December, but again, because Uruguay wanted to grant asylum. pendant garcía had gathered in front of the hospital. Odebrecht has admitted to having almost $ 800 million (708 million euros) in bribes to powerful politicians in the Latin American region in return for lucrative government contracts paid, including 29 million dollars to politicians in Peru. Here there are more Ex-heads of state suspected to be in one Form or another in the corruption affair involved. last year, President Pedro Pablo Kucyznksi resigned after opposition politicians had revealed that his company had received more than a decade ago to about 700,000 Euro converted from the Brazilian group. Some of the payments were in Kucyznksis term of office as a Minister. Last week Kucyznski came in custody. On Tuesday, he was admitted because of a heart condition in a hospital in Lima. Kuczynski also challenges to be in the corruption scandal. Also against the Ex-President Ollanta Humala (government, 2011 to 2016) and Alejandro Toledo (2001 to 2006) investigations on the question of whether they accepted illegal payments. Toledo, after learning of the allegations, took refuge in the United States.